Background: Back pain is a common concern among sedentary office workers. The objective of this study is to evaluate the intensity of back pain in sedentary administrative workers, the effect of working conditions and duration of working hrs on the back pain and to determine the disability types associated with back pain among administrative staff. Conclusion: There is strong correlation between participants BMI and the impairment level of walking, sitting and social life. The majority of women having work related back pain are of young age. Therefore, health education may be effective to assess and give them the right instructions to live without back pain or to reduce the pain if exist. A questionnaire was distributed among females working in both governmental and private institutions in Riyadh, 100 participants included, all administrative desk-jobs employees between 20 years to 40 years of age. There result was assessed using Oswestry Disability Index for measuring lower back pain disability, and a short version of the International Physical Activity Questionnaire was used to assess physical activity. The data was analyzed by SPSS V16.0. Results: In this study 26%of the participants are < 28 years of age, and the mean BMI of the participants is 26. Around 20% of the participants have back pain for 1-3 years. The Oswestry Index showed 38% of participants did not experience any pain, 32% are complaining of moderate back pain while 22% have very mild back pain, and only 4% suffered severe pain. The study showed 68% of the participant who are affected by the pain did need any assistance with their daily personal care. As for the number of missing working days 44.4% stated that they did not miss any day because of back pain, while 24.8% reported missing 1-2 days because of disabling pain. Conclusion: There is strong correlation between participants BMI and the impairment level of walking, sitting and social life. The majority of women having work related back pain are of young age. Therefore, health education may be effective to assess and give them the right instructions to live without back pain or to reduce the pain if exist. Back pain is seemingly a common problem among many office workers globally. Apparently large numbers of clerical and other administration staff in Saudi Arabia are suffering from back pain [1,2]. There are several types of back pain that numerous people complain from. The existing difference in defining chronic back pain varies from general and sporadic back pain lasting for up to 12 weeks to a specific underlying pathologic pain or frequently reoccurring pain . It is predicted that a large number of the general population will experience back pain at some point in their life. Among them are occupation related back pain injuries [4-7]. All across the spectrum of back pain causes could be classified as occupation related hazard. Therefore, it is vital to identify the causes of major back pain at work. It is also absolutely important to minimize the risk of developing such problems. Identifying the risk factor and causes in relation to a work place or work habit can significantly assist in reducing the morbidity rate as well as reducing socio-economic losses. Back pain is becoming a common concern among sedentary office workers. The incidence of this pain is rising up to 46%. The rate of back pain among administrative employees is high especially in upper part of the back being the most common complaint followed by the lower part of the back pain. The World Health Organization, WHO reports showed jobs that involve physical inactivity to be the fourth leading cause of worker’s mortality. Such reports estimated that 37% of occupation related causes of back pain resulted in a major economic loss [4-8]. It seems that studies on occupation related back pain are lacking or at least rare. Especially in Saudi Arabia. 1. To evaluate the intensity of back pain among sedentary administrative workers in Riyadh, Saudi Arabia. 2. Determine the effect of working conditions and duration of working hrs on the back pain. 3. Determine disability type associated with back pain among administrative staff in Riyadh, Saudi Arabia. A cross sectional study conducted using a questionnaire that was distributed among females working in both governmental and private institutions in Riyadh, the capital city of Saudi Arabia. One hundred employees voluntarily filled the questionnaires. They are all administrative desk-jobs employees between 20 years to 40 years of age. The participants are assessed by the use of Oswestry Disability Index for measuring lower back pain disability. As well as, the short version of the International Physical Activity Questionnaire for physical activity assessment was used. The questionnaire was distributed in 2 languages; Arabic and English. The translated version to Arabic was reviewed by 3 bilingual speakers. The collected data was analyzed by the use of SPSS V16.0. It found that the mean age of employees having back pain was 34 years old. It was also found that 26% of the age groups <28 years and between 33 years to 38 years said to have back pain. which agrees with other researchers who found that the incidence of back pain was high in young employees . The mean of the BMI for employees having back pain is 26 and stander deviation is 5.2 (Table 1). Table 1. Characteristics of 100 female desk employees involved in the study. BMI was positively correlated with the impairment level of walking, sitting and social life (r=.009, .328, .019 and .005) respectively this correlation was significant (P<0.01). In this study 20% of the participating employees said to have endured back pain for 1 year to 3 years of their lives. In addition, 15% said that the duration of their back pain was occurring for more than 10 years and 6% said it was over 1-6 months (Table 2 and Fig. 1). Fig 1: Figure depicting duration of back pain. Table 2. 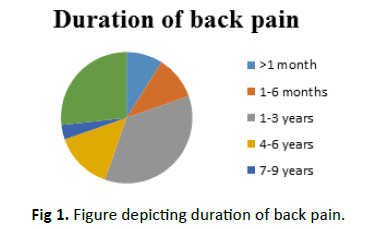 The percent and numbers of the participants according to the duration of back pain. Furthermore 53% knew the cause of their pain. Some mentioned the causes to be pregnancy, giving birth, long hrs of sitting, gaining and losing weight. And 12% said that the cause of their back pain was work related. In relations to numbers of hrs spent in a work space 50% of the participants said that they spent 4 hrs to 6 hrs sitting on a desk. The other 50% spent 7 hrs to 10 hrs of sitting. Based on the Oswestry Disability Index, 38% of participant had not experienced any pain, 32% were complaining of moderate back pain followed by 22% of very mild back pain (Table 3). The study only revealed 4% with fairly severe pain and 3% of very severe pain, and only 1% who suffered from the worst pain imaginable (Fig. 2). Fig 2: Figure depicting pain intensity. Table 3. 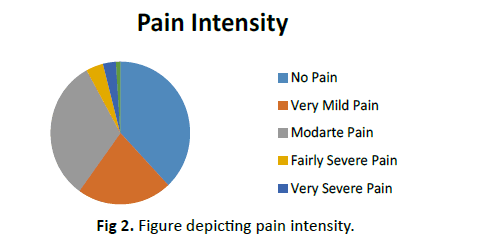 The percent and numbers of the participants with different pain intensity. By evaluating the need for assistance, it was found that 68% did not experience any pain while carrying on their daily routine. However, 28% were having pain while taking care of themselves but, the pain did not prevent them from completing their daily care routine. 3% experienced a degree of pain that prevented them from taking care of themselves which caused them to seek assistance to complete their daily routine. The effect of weight lifting amongst participants shows 40% can left heavy objects but caused them pain, 31% can left objects with no pain, 11% were only able to lift very light weight, 9% were prevented from lifting heavy objects off the floor only if it is on a higher place like the Table 4, 5% can lift medium weighted object and positioned in a convenient place and 2% couldn’t left or carry anything at all. Table 4. Correlation of different age group and different variables. In assessing participant’s ability to walk without feeling any pain the study found the highest percentage of 71% represent that the pain does not prevent them from walking any distance, 20% were able to walk for more than one mile, the lowest percentage who were unable to walk more than half a mile was 8%. The results of evaluating employees sitting situation revealed that 49% were able to sit on any chair for any duration of time. It also revealed that 35% can sit on specific chairs for as long as they want, 14% experienced pain preventing them from sitting for more than one hour, and 2% couldn’t sit for more than 30 mints because of the pain. As for the question on standing the study showed 29.1% of participants can stand as long as they want without feeling pain, while 38.5% reported that they can stand but did feel pain. On the other hand, 5.1% mentioned that the pain prevented them from standing for more than one hour. In addition, 6.8% stated that the pain prevented them from standing for more than 30 mints and 6.0% had pain after standing for 10 mints. Furthermore, comparing employee’s ability to stand to their age the majority of those suffering were older than 39 having a significance of (P≤0.006) (Table 4). The answers for the question on normal life indicated that 49.6% of participants had normal social life without pain. It also indicated that 17.1% of participants showed that their social life was normal, but the effect of back pain is slightly increased with activities. In addition, 9.4% of people reported that the pain limited their activities without affecting their social life, while 8.5% of participants said their social life was restricted because of pain. In regard to the question on missing work 44.4% of participants stated that they did not miss any day of work because of back pain, while 24.8% reported missing 1-2 days in the last 18 months because of disabling pain. Also 8.5% missed 3-7 days of work due to their pain. In addition, 2.6% missed their work from 8-14 days because of pain. Only 0.9% of the participants said they missed 15- 30 days because of pain. On the other hand, 2.6% missed their work for one month due to pain. Another 0.9% of the participants said they missed their work from 3-6 months due to pain. Finally, 0.9% of people missed more than one year of their work due to pain. This study found that female employees in Riyadh city experiencing back pain are mostly young females. It showed the mean age of those female employees suffering from back pain is 34 years of age. This finding is supported by the number of younger group who are between 28 years to 30 years of age making 26% of the participants in this study affected by back pain. In addition, back pain seems to be severe among those who are overweight and obese employees more than others within the whole participants in the study. A positive correlation between employees BMI and the intensity of their back pain was found in this study. This agrees with other studies stating the cause is more likely to be idiopathic [9-11]. The result of this study goes along with other studies wherein prolonged inactivity increases the risk of having back pain [12,13]. There are indications that participants spending 4-10 working hrs on their desks will most likely experience back pain. On the other hand, those spending less than 4 hrs sitting on their desks are less likely to experience any pain. This suggests that the more hrs spent sitting on some desk employees are more likely to experience back pain. The majority of participants in this study knew the causes of their back pain to be due to their working habits. They claimed that it was due to awkward posture, prolonged sitting, disc herniation, underlying medical conditions, pregnancy and birthing. Only few amounting to 12% of the study group said the pain they were experiencing was caused by work related injuries. When evaluating employees sitting situation most of them said they were able to sit on any chair for any duration of time. This indicates improper selection of the appropriate chair. Others said they were able to sit on specific chairs for as long as they wanted which also indicates they may not be aware of the hazard associated with sitting for a long time on a chair. A small number of participants 14% experienced pain preventing them from sitting for more than one hour which could most likely be due to sitting on unappropriated chairs, sitting on one chair for too long or both reasons. Other reasons for the cause of pain in this situation may apply. A smaller number of participants 2% weren’t able to sit for more than 30 mints on their chairs because of back pain which is possibly a consequence of negative sitting habit at work. As for being absent from work because of back pain nearly half of the employees who participated in this study had never missed a day of work. This is a positive sign that they could avoid further back problems if they follow appropriate sitting habits. The rest of the study participants reported missing different numbers of days from work because of disabling pain. It is evident that a high number of employees are missing a high number of days from work which confirms the severity of the back-pain problem due to sitting habits. Furthermore, these absences from work can lead to major economic losses to any organization as stated by the World Health Organization . There is strong correlation between participants BMI and the impairment level of walking, sitting and social life. The study found that the majority of women having occupation related back pain to be of young age. This may imply that the underlining cause of back pain in desk employees could be idiopathic and not degenerative. Therefore, it is necessary to increase the awareness toward regular exercising and not to sit more than 40 mints without movement in addition to more awareness about appropriate sitting position. Therefore, health education and campaigns may be effective to assess and give them the right instructions to live a healthy life without back pain or to reduce the pain if exist. The authors would like to acknowledge with many thanks Mr. Mohammad Sulayem, Dr. Saleh Al-Dabil and Dr. Amal Fayed for the guidance, assistance in analyzing and reviewing the text. Paul J.M., Rolf H.W. : Back posture and low back muscle activity in female computer workers: A field study, In Clinical Biomechanics. 2009;24:169-175. Gerr F., Marcus M., Ensor C., et al. : A prospective study of computer users: I. Study design and incidence of musculoskeletal symptoms and disorders. Am J Ind Med. 2002;41:221-235. Ranasinghe P., Perera Y.S., Lamabadusuriya D.A., et al. : Work related complaints of neck, shoulder and arm among computer office workers: A cross-sectional evaluation of prevalence and risk factors in a developing country. Environmental Health. 2011;10:70. World Health Organization. Global health risks: Mortality and burden of disease attributable to selected major risks. World Health Organization; 2009. Davis K.G., Kotowski S.E. : Postural variability an effective way to reduce musculoskeletal discomfort in office work. Human factors: The Journal of the Human Factors and Ergonomics Society. 2014;56:1249-1261. Nemoto O., Kitada A., Naitou S., et al. : A longitudinal study for incidence of low back pain and radiological changes of lumbar spine in asymptomatic Japanese military young adults. Eur Spine J. 2013;22:453-458. Cheung K., Gillen M., Faucett J., et al. : The prevalence of and risk factors for back pain among home care nursing personnel in Hong Kong. Am J Ind Med. 2006;49:14-22. Cho C.Y., Hwang Y.S., Cherng R.J.: Musculoskeletal symptoms and associated risk factors among office workers with high workload computer use. Journal of Manipulative and Physiological therapeutics. 2012;35:534-540. Malińska M., Bugajska J.: The influence of occupational and non-occupational factors on the prevalence of musculoskeletal complaints in users of portable computers. International Journal of Occupational Safety and Ergonomics. 2010;16:337-343. Carr L.J., Leonhard C., Tucker S., et al. : Total worker health intervention increases activity of sedentary workers. American journal of preventive medicine. 2016;50:9-17. Mohseni-Bandpei M.A., Fakhri M., Bagheri-Nesami M., et al. : Occupational back pain in Iranian nurses: An epidemiological study. Br J Nurs. 2006;15:914-917. Pronk N.P. : Reducing occupational sitting time and improving worker health: The Take-a-Stand Project, 2011. Preventing chronic disease. 2012;9.